I've been detoxing this week, and after a few days of subsisting on smoothies and soup my reduced regime has got me thinking about puréed foods and people that love them. While the likes of Gwyneth Paltrow and the elderly are huge proponents of easy to process foods, I think the biggest fans of blended delights would have to be babies. They can't get enough of almost anything mixed together and put in a petit pot. As an adult, I too can understand the benefits of a very veggie and parfois puréed daily menu. I was pleasantly surprised by the heartiness (and tastiness) of the brocolli and arugala soup I made the other day, and my interest is peeked in regards to the Super Greens Juice (Kale, Pears, Celery, and Ginger) that I'm supposed to eat later this week. But it's not just the taste or simplicity of these dishes that is intriguing- it's also the fact that I can make them for a fraction of the cost that I would pay for a smoothie or soup in the market. The fact that I use whole foods, no dairy, and have a blender at home makes the choice to eat puréed veggies an obvious one, both economically and health-wise. It is for these reasons that I, a childless and semi-unemployed blogger, am going to just go ahead and say, I think it's a good idea for everyone to make their own baby food. I've qualified this because I'm not a mom, I have a lot of free time, and I have a blender. If you differ from me in any of these ways and don't think becoming a Chef Baby-dee is an option, I totally understand. But, recent articles that mommies have sent me about the questionable safety of the plastic packaging that many baby foods are sold in, as well as the plastic bottles used to feed infants everyday, have made me think that DIY baby food production may be a more reassuring choice, as well. Also, packaging is wasteful. If you can't re-use it, then it's bad news for everyone- why not invest in buying glass containers that you can use and reuse, without any risk to Mother Earth and Baby Human? I buy yogurt at biocoop in a super convenient-sized glass container, the buy-in is around 2.50€ but I get to eat the yogurt and then I reuse and share the poison-free containers. 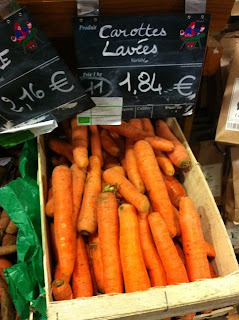 Step 1: Skin and Steam your carrots (or boil in a little water) until tender. Save the water for later, it may be needed. Step 2: Move carrots to blender (or a bowl if your using a hand held mixer**). Mix/blend/mash. Make sure there aren't any lumps- you can get rid of any tricky chunks that won't break down. Step 3: Let your purée cool down. Try it out on the bundle of joy. If she's into it, put the rest away in your glass container and save in the fridge for no more than 5 days. *Replace carrots with potatoes, broccoli, etc. or fruits like bananas and pears, then repeat the same steps to come up with other purées. **If you have neither blender nor mixer, steam your carrot until it's tender enough to mash with a fork, adding the reserve water to help liquify your purée. Step 1: Thouroughly wash your fish and veg (if you have a bamboo steaming basket that is ideal for this recipe, then you can boil the fish and stem the broc at the same time, if not you can do it in two seperate pots). Step 2: For the fish: Bring a cup of water to a simmer and submerge your fish in the water. Leave it there until it turns bright white. Remove from heat and let poach in the water for another few minutes. 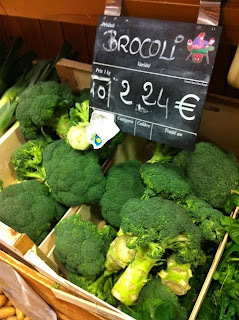 For the brocolli: Steam until bright green. Step 3: Let your fish and broccoli cool down. Pat the fish dry and do a paranoid check for any bones. Step 4: Mix/blend/mash and dinner's served. *You can liven this up by using a homemade broth instead of water.